i have no idea why my fish, full frontal, became monstrous. they almost keep me running, those scary monsters, running scared (thank you bowie). and they also seem to shut me up, which only happens on rare occasions. intrigued, by fish around the world, via elisabeth. update, something fishy. i really had to smile when i opened up your snail mail, elisabeth. fetching contents too! and let the red one swim on dry land. (may the chaotic surroundings represent the wild, wild sea). i think i am passionately in love! ☻cheers, ♥!! Will try to send you a pic of the fish from Snugglepot and Cuddlepie (an Australian classic)some of the fish in it are very scary. I like that David Bowie song. Kylie is right, you will love the fish from Snugglepot & Cuddlepie, infact I think you will love the whole book! I've just been catching up on sooo many Wolfy posts, you have been very busy, I shall be here all night. and what a fine not-fishy-at-all-colour! Wow, I could have used your fish for an exciting fairy tale! Bearded fish are the most inspirational! :) And I'm glad snail mail travelled fast enough for the drawing challenge. 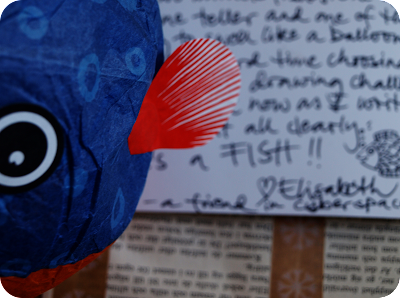 The magical fish seems to have told you of fortune :) And I do like this fish header! 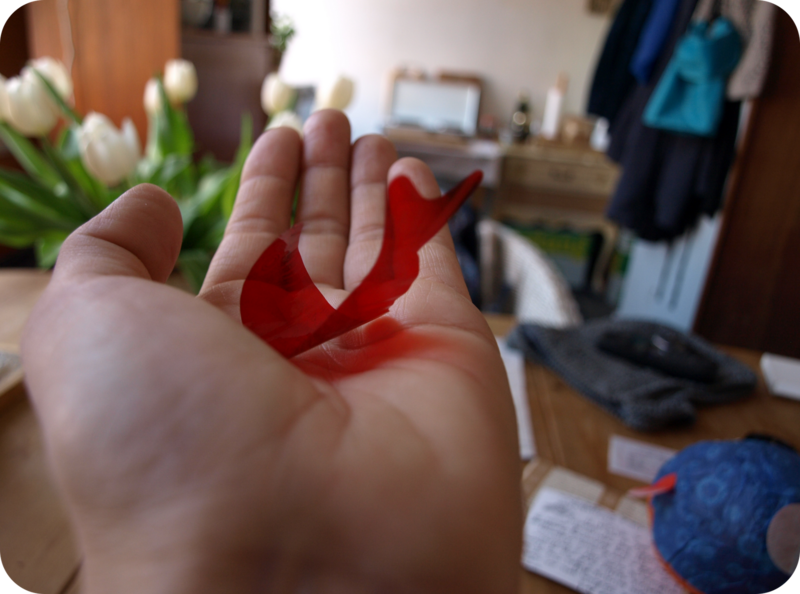 You gave a wonderful paperfish breath of life...dear Nadine, thats great! And your book-fishes has got a colour which I love...call it mauve. So your monstrously fishes looks opponent. Really balanced. Yes, and your header is more as up to date! Not really monstruous ;) I like your fishes... they are "uniques". 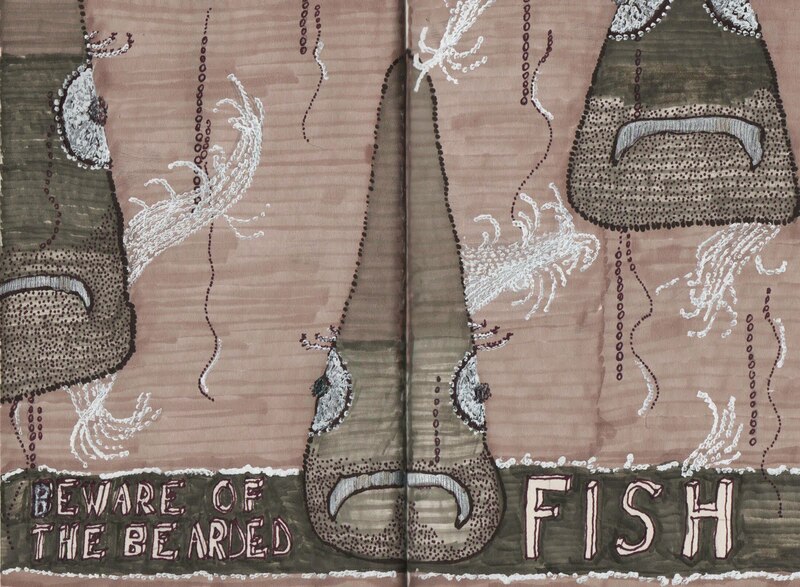 i have never seen a fish that scary or with that much stubble! and what a nice package from Elisabeth. our fishes, tok and smoocho will be returning home soon. they have been in the care of friends while we have been away. 2 goldfish, i'm amazed they are still alive. our friends have been caring for them longer than we have! i like your fish and all of your thrifty finds and photos in the newer post. i wish my kids loved thrift stores. but then i might be in trouble. 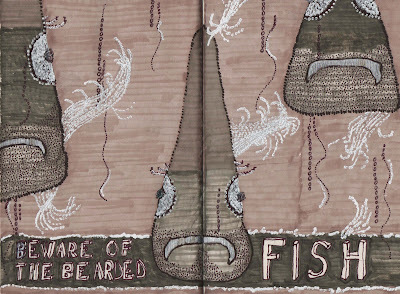 Your surroundings look serene and beautiful ... though I must admit that fish scare me a little.